Will and I are both team leaders at our school. He represents 5th grade- I represent 8th. Because these meetings are held after school on Mondays, last year I suggested we have them off campus- somewhere we could be comfortable, away from school... and most importantly, have a snack. These meetings now happen in our home. I can't lie- I love it. Will isn't as happy about it as I am, but I think he has accepted his fate. I love having people over and feeding them. This is a genetic thing, I'm pretty sure. When I was little, family gatherings almost always happened at our house. Both my parents are fiercely good cooks who don't know how to cook for anything less than an army. As a result of holding these meetings every other week at our house, I've learned to stock my pantry so I can put out a spread at a moment's notice. I always have at least 3 kinds of cheese- usually a brie, a cheddar and a gouda. Olives and pickles make frequent appearances. But chips and salsa are the one constant. Up until now I've always purchased deli salsa. I know- shocking. When it comes to feeding Will and I, homemade is always the preference. I guess I just get caught up in the convenience thing. Well that's all about to change. At our meeting tomorrow, I will have a much better alternative. Periodically, I take an inventory of my cookbook collection. Yesterday was one of those times. I found a cookbook that used to be out on my counter all the time when we lived in Alamosa. 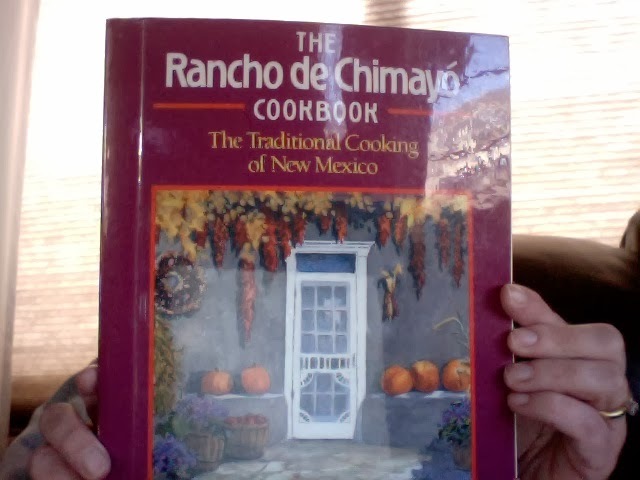 It's called The Rancho de Chimayo Cookbook. It was written by Cheryl Alters Jamison and Bill Jamison. The book is not only a phenomenal resource for New Mexico cooking, it's also a chronicle of the Jaramillo family and their restaurant in Chimayo, New Mexico. I heard about the restaurant from one of the ladies I taught with in Alamosa. I never made it to the restaurant before we moved to Rifle, but I did track down the cookbook. It was published in 1991, but I don't think it's in print anymore. I found it on www.half.com and snapped up the only copy they had at the time. In Alamosa, I could readily find most of the ingredients needed to make the spicy dishes. In Rifle, some of them are a bit of a challenge. I suppose that's why it ended up forgotten on the top row of the cookbook shelf. I dropped the book on the counter and it fell open to my favorite recipe. The pages are stained with tomato juice. The recipe is for the salsa the restaurant serves to all guests. It's simple and spicy. Instead of doing all the fussy chopping, I usually dump everything in my blender and let it do the work. This makes quite a bit. I have enough for the meeting tomorrow, and to freeze for at least a month! If you heated it in a saucepan, you could probably even can it.